Stephen Scherr is the firm’s Chief Strategy Officer, Chief Executive Officer of Goldman Sachs Bank USA and Head of the Consumer & Commercial Banking Division. He chairs the Goldman Sachs Bank USA Management Committee and serves on the Management Committee, Firmwide Risk Committee, Firmwide Finance Committee, Firmwide Investment Policy Committee, Firmwide Hedge Fund and Private Equity Screening Committee and Growth Markets Executive Group. 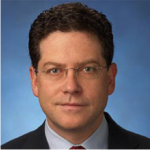 Mr. Scherr joined Goldman Sachs in 1993 as an Associate in the Financial Institutions Group. In 1996, he transferred to Emerging Markets/Capital Markets in the Fixed Income, Currency and Commodities Division. In 1998, Mr. Scherr moved to the Communications, Media and Entertainment Group and served as Chief Operating Officer of the Telecom, Media and Technology Group from 2004 to 2005. He served as Chief Operating Officer for the Investment Banking Division from 2005 to 2007 and was Head of the Americas Financing Group before serving as Global Head of the Financing Group from 2008 to 2014. Mr. Scherr became Chief Strategy Officer in 2014, and led the firm’s Latin American business from 2011 to 2016 before assuming responsibility for Goldman Sachs Bank USA. He was named Managing Director in 2001 and Partner in 2002.